The Oscars just wouldn't be the same without all the swag, right? Motorola is giving away limited edition gold Motorola XOOMs to every Oscar nominee, and you could get your hands on one as well! And let's be real: $800 is a lot of money. The sweepstakes, occurring from now until 11:59 PM on February 28th, will award 2 lucky winners with a gold Motorola XOOM, as well as a blingtastic gold-embossed slipcase. 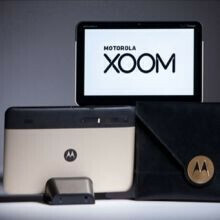 To enter, simply retweet all of the Motorola Mobility accounts posts, and add the hashtag "#motoxoom". Every retweet will count as one entry. The contest is limited to U.S. residents over the age of 18, and you obviously can't be an employee of Motorola Mobility, or a relative of such an employee. The two potential winners will be announced on March 1st, but if the winners don't respond promptly, the gold XOOMs will default to the next contestants. So check your inbox! For more information, check out the link to Motorola's Twitter page below.